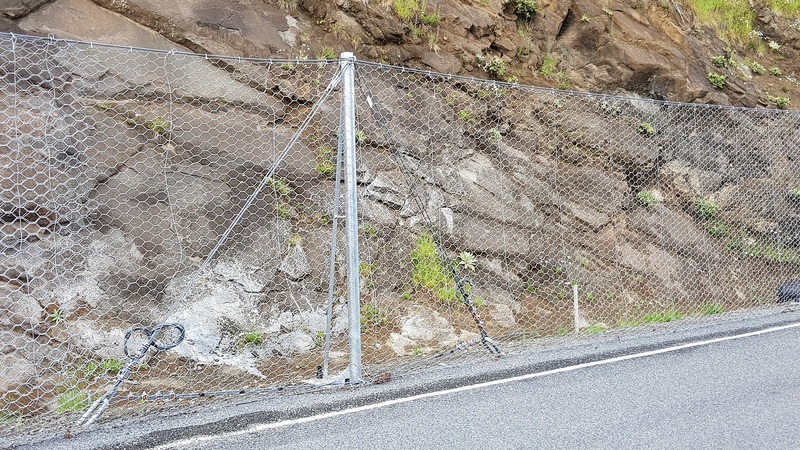 When a drapery systems cannot be installed due to access, topographical or economic considerations Dynamic Rockfall Barriers/Catch Fences offer a rockfall protection solution for intercepting and stopping falling rocks and boulders. Geofabrics offers a range of Maccaferri rockfall barrier fence systems designed to intercept falling rocks which have detached from the rock face above which may cause damage to infrastructure below and in severe cases loss of life. Rockfall barrier fences of variable geometry are fabricated from a complex system of steel cables, connections of steel cables to structural elements, energy absorbing devices and anchorages, capable of high deformation capacities which are designed to be easily transported and assembled in extreme conditions. The range of barriers for rockfall problems include debris flow barriers, dynamic rockfall barriers and hybrid and attenuation barriers. Geofabrics range of Maccaferri dynamic rockfall barriers are designed to deflect under load and absorb energy and are available with energy absorption capacity up to 8,500kJ. When a solution cannot be implemented in the detachment zone, possibly due to technical, topographic, access or economic issues, other options need to be considered. In these cases, a cost-effective solution is often provided by installing dynamic rockfall barriers within the transit or impact zones. These dynamic barriers or ‘catch fences’ are positioned to intercept and stop falling rocks and boulders. The system, when it arrives on site, includes all posts, base plates, netting, braking systems, anchor cables and ground anchors (for typical ground conditions). Ideally suited where space is limited these barrier fences are easy to install by qualified rope access contractors experienced in drilling and working on rock faces. After impact maintenance is a simple process of removing the collected debris and replacing the compression brakes and checking the serviceability of the remaining components. The high number of field tests conducted by Maccaferri to the strictest international standards permits Geofabrics range of Maccaferri rockfall barriers to be used to protect most road and rail infrastructure works as well as protection of buildings, pipelines, in mine works and where rockfall is identified as a hazard. To assist engineers with the design process, the Geofabrics team of engineering specialists are available to give technical advice in the use of the software as well as provide traning in-house or via seminars.